The Configuration Backup/Restore section of your Linksys Wireless-AC Access Point’s web-based setup page allows you to download the configuration file from your access point to an external storage/computer or to upload a previously saved configuration file from an external storage to your Access Point. 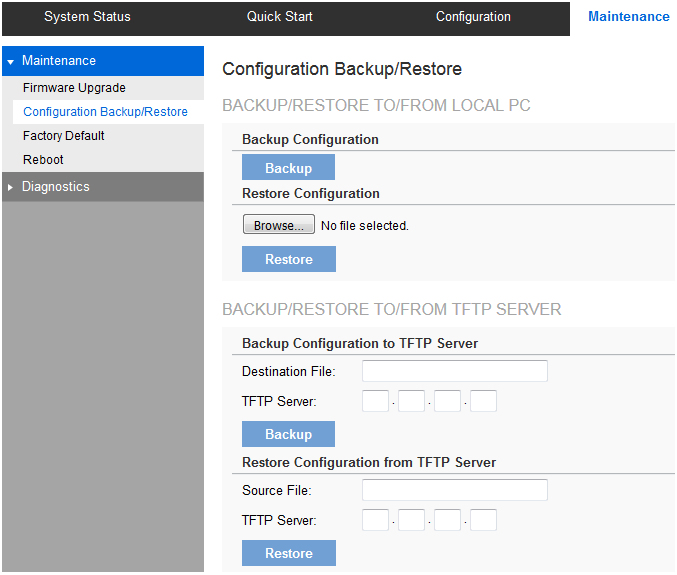 NOTE: Saving a configuration backup file to your computer or to an external storage after installing the access point is highly recommended so you can easily restore its settings from this file. If you don’t have your browser set up to save downloaded files automatically, locate where you want to save the file, rename it if you like, and click Save. Locate and select the previously saved backup file. Enter the destination file name you plan to save in TFTP server. Enter the IPv4 address for the TFTP server. Enter the source file name stored in TFTP server.